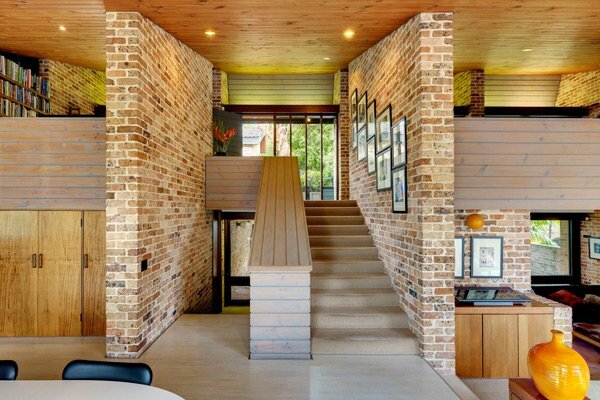 The Erby House strikes the perfect balance between openness and privacy. 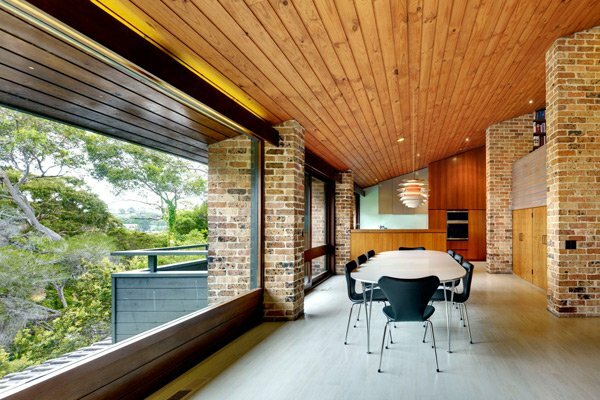 Completed in 1971, the (almost) mid-century home was designed by Jonathan Erby, one third of Devine, Erby & Mazlin, a studio operating out of Sydney, where this particular home is also located. Privacy has been achieved by having the house perfectly oriented to a north/south axis. 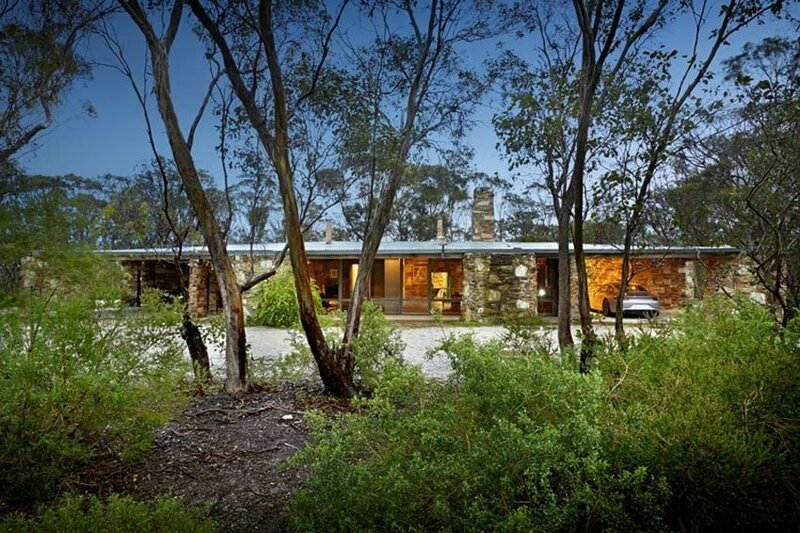 This maximises views of the bushland of Scotts Creek, Sugarloaf Bat and the North Arm Reserve, while also obscuring the view looking down from higher points on the east and west-side of the house. 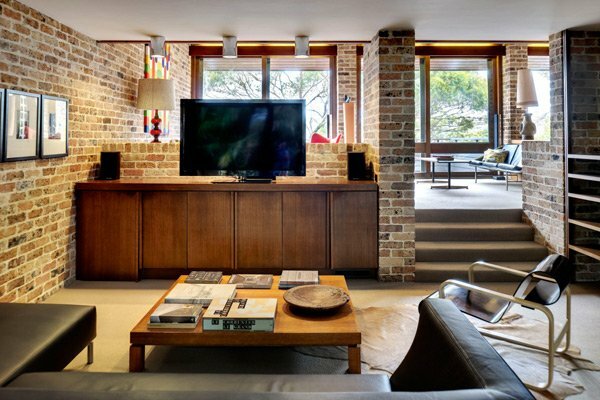 Openness, meanwhile, is clear for all to see in the spaciousness afforded by the modern home’s interior layout. 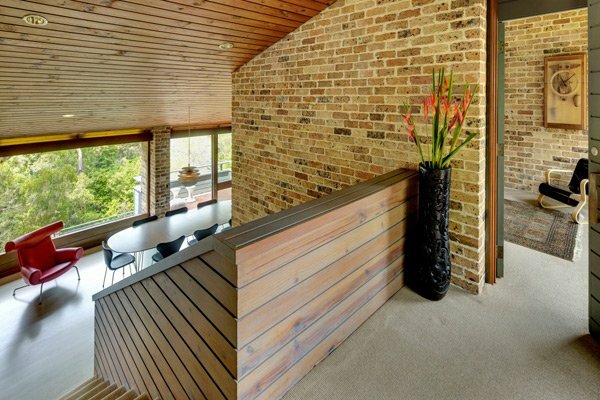 On that note, one of the things that immediately captured our attention about the interior design is the brick work. In terms of colour, the bricks are far from uniform, instead displaying a diverse palette, from cream and peach, through reddish browns and all the way to dark grey. These bricks are also often speckled, such that a few of these colours show up on each brick to varying degrees. 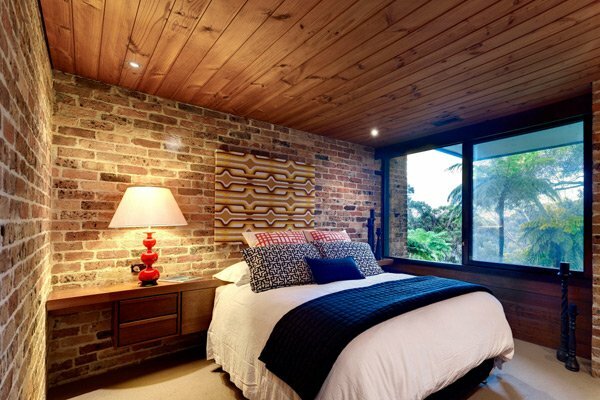 This is the kind of rich texture you’re more likely to associate with the wood features in a home rather than the brick work. 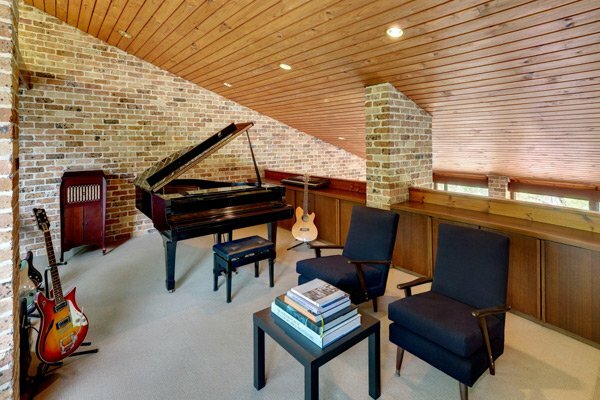 But in fact, the woodwork is also quite remarkable, and thus resonates rather strongly with the peculiar brickwork. 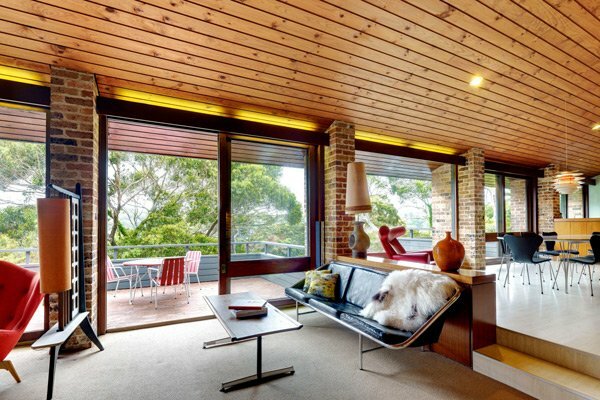 Long timber planks line the steep sloping ceiling, which stretches across two levels. Meanwhile, the built-in cabinetry is as sleek as you’re ever likely to see, especially in the kitchen where, for instance, the cupboards surrounding the oven stretch all the way up the ceiling, thus representing a subtle reminder that everything was custom made (as if we needed reminding!). 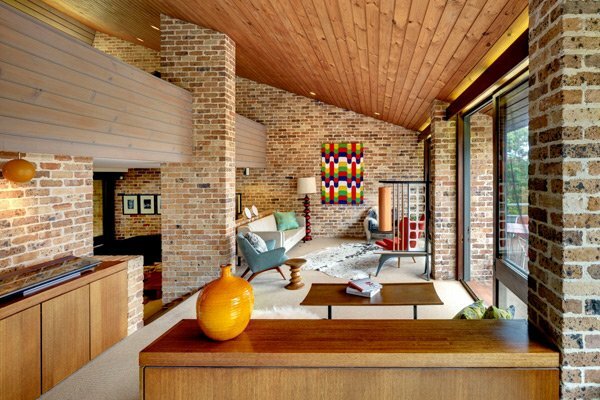 All this is nicely offset by the various furnishing and mid-century modern furniture that dots the house, which is mostly coloured in much bolder, chunky blocks of primary and secondary colour. 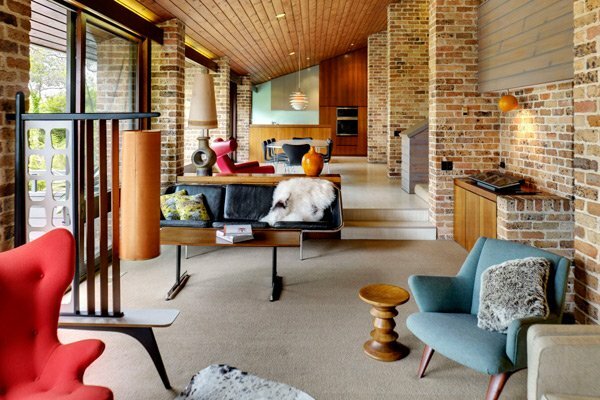 Take the furnishings in the central living area. There’s a couple of bright red lounge chairs have been placed on either side of the space, along with another chair upholstered in turquoise, while, a bright orange vase sits on top of a cabinet in the middle of the room. Such flourishes are brought together brilliantly by an abstract painting that hangs on the side of the space which is furthest from the kitchen. Really providing a stark contrast with the brick spectrum of peach red and brown.